The stock market sustained its winning ways this past quarter and so did your investment portfolio. Stock prices continued to work their way higher, despite many worrying global tensions, political infighting, falling oil prices and another Fed interest rate hike. This type of behavior is often the trademark of a durable bull market—that is, its ability to brush aside negative information and keep rolling along its merry way. Can the market continue to look past the negatives and reward investors? The short answer is: Yes! We feel the market has plenty of fuel to travel higher. During 40 years of managing your valuable assets, we have often found that ‘expert’ opinions, reasons and forecasts are not very reliable. Long ago, we replaced opinions with well-reasoned and thoroughly researched models to help us make disciplined decisions. No matter what the news headlines might read that can affect investor emotions, you can rest assured our investment process includes three essential layers of methodical risk management. 1.) The first layer of protection is keeping a close eye on business cycle data because history demonstrates most major market declines (-20% or more) occur during recessions. Our Recession Watch Indicator (featured in the April 2017 newsletter) continues to signal a very low risk of recession any time soon and suggests there is room for stock prices to move higher. 2.) The next level of protection comes from one of our primary risk management tools, the Stock Speedometer (last featured in our October 2016 newsletter). Today, the model is at its maximum positive reading of 100%, reinforcing the strong potential for the stock market to advance. 3.) The third layer of risk management includes a stringent process to identify attractive stock investments that share three common investment traits: Quality, Value and Income (QVI). QVI is a hallmark of our investment philosophy with the goal of generating better long-term returns with less risk for you. The combination of both a top down (business cycle and market trends) and bottom up (QVI—fundamental analysis) approach is designed to smooth out your investment journey. Stock market corrections and the occasional painful bear market are inevitable in the financial world. Your successful investment results and a secure retirement depend on having a disciplined and pro-active strategy to better sidestep major declines and enjoy the good periods. Throughout our 40 year history, this pro-active investment strategy has been the cornerstone of our portfolio management and resulted in steady risk-adjusted performance for you. Although the stock market path appears clear, we are on constant alert for any changes that require making defensive portfolio adjustments for you. Your portfolio is being closely monitored for two potential hazards. First, the Federal Reserve’s announced quantitative easing reversal that is expected to take place later this year. Our concern is that reversing 9 years of the very easy money policy (zero interest rates) by the Fed could add market uncertainty. The second hazard is the current passive investing mania that investors are piling into. The love affair with passive investing and the latest versions termed ‘automated investing’ and ‘robo-advising’ is nothing more than chasing the performance of a recent style winner. This, in our opinion, will not end well. Look back to the 1990’s to 2000 for the most recent outcome of ‘indexing’ or ‘buy and hold’– the earlier forms of passive investing. Investors, especially those nearing retirement, would do well to study that period and the years following to see its results to one’s retirement nest egg. Unfortunately, a passive strategy designed to capture all of the gains as the market moves higher will also capture all the losses during market declines. Inevitably, as bear markets grind lower and inflict pain, ‘buy and hold’ investors recognize much too late that the approach entails a lot more risk than they first assumed. Ultimately, many capitulate when losses decimate their portfolio and only sell when the pain and emotional intensity can no longer be stomached. In our lengthy careers as fee-only financial advisors, we have never met a passive investor that did not feel disillusioned after losing a significant amount of wealth during a bear market. So, just how dangerous is passive investing? 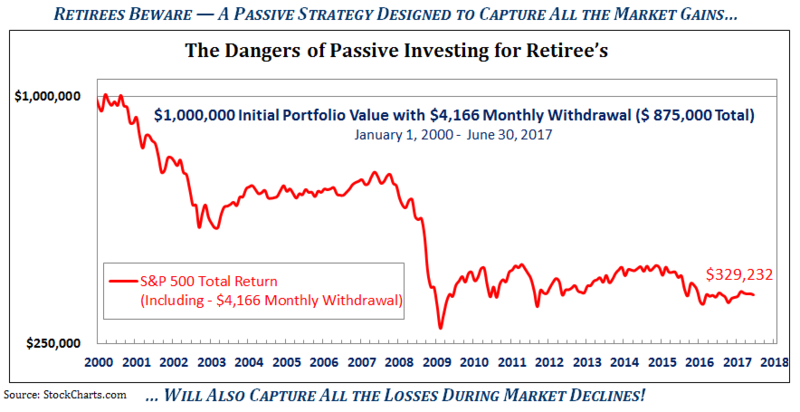 The illustration points out the major fallacy of passive index investing for retirees. Let’s demonstrate the effect by comparing results for a hypothetical retired couple – Mr. and Mrs. Smith. The case study of an initial $1,000,000 investment portfolio with a seemingly safe 5% annual withdrawal by the Smiths illustrates the impact of $50,000 yearly withdrawals ($4,166 each month) during the challenging stock market environment since 2000. If the Smiths retired with $1,000,000 at the beginning of this century, passively invested those funds in an S&P 500 index fund, and took regular withdrawals, they are clearly at risk to outlive their hard earned retirement nest egg. On the other hand, we believe a pro-active risk management investment process is the better solution to safeguard your retirement lifestyle. For example, during the same difficult period, we delivered on our dual mission to help protect your standard of living and preserve your valuable nest egg. Your portfolio is grounded in multiple layers of active risk protection with core investments having the additional safety factors of high quality, sound values and higher dividend income. Having many levels of disciplines gives us confidence your investment portfolio is poised for continued growth. As well, our pro-active strategy is designed to adjust to potential market hazards and changing conditions in an effort to keep you well-protected. 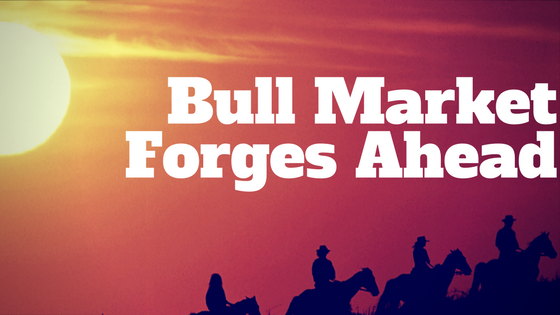 All things considered, we feel confident this durable bull market looks to continue to forge ahead and build on your profits through the second half of 2017.